Cell phones and other mobile devices are beginning to take whole in classrooms around the county. And let's face it, even if our schools or districts haven't embraced the technology for learning, kids are still using phones whether we know it or not. According to Pew Research the cell phone "has become the favored communication hub for the majority of American teens." I am not sure any of us would argue. Many kids, if not most, have a phone. And according to the same Pew Research poll, text messaging far out weighs any other type of use of the phone. And the average teen sends 3000 texts per month. My sister (12 years old) got a cell phone for Christmas last year. With in 8 days she racked up over 1500. So needless to say, text message in an important form of communication for school-aged kids. Being able to quickly and effectively communicate with students is important. And there are lots of ways to do it. I have advocated Twitter and Facebook in the past. But maybe there is an even easier way? Maybe we can take what we know about text messaging and use that to our advantage somehow? ClassParrot is a relatively new service that allows teachers and students/parents exchange text messages without exchanging numbers. Here is how it works. 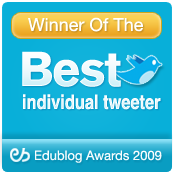 You as the teacher create a free account. Once you have the account you create a class. Now, the class name is important because it was will be attached to every text so it is important to choose something everyone will recognize. Then you have to decide if Parents/Students will be able to reply. That is what sets ClassParrot apart. If you allow this anyone who subscribes can reply. But, what is great is you can turn it off if you don't want this feature but you can only set it up when you create your class. Anyway, now that you have a class you will get a unique number and code to text too. This is what you give to students. The number they will be texting to is not your phone number, rather it is a number that is generated by ClassParrot and assigned to your class. When the students reply they then follow the series of texts they get to give their name so the teacher knows who they are. In your class account you can see who is subscribed by name and if need be you can delete someone. But again, no other information is there. No phone number, email address, anything. Ok, so yes, ClassParrot is free. But...it works on credits. When you sign up you get 500 credits. And each month you get 200 more. It costs 1 credit to send a message or a poll. And it costs 1 credit each time someone replies. An unlimited plan is $9 bucks so not too bad but I know budgets are tight. If you simply turned off the reply feature and just used it to broadcast you would probably never need to pay. You have to decide what is going to work best for you. ClassParrot could be a great service if you want to help classes keep up with assignments or dates. Or for coaches/sponsors who have afterschool activities where it might be great to keep parents informed of schedule changes or what have you. Overall I like ClassParrot for the privacy aspect and ease of use. And I think it has the potential there to open up communication with your parents/students in a familiar and easy way. In this book, geared towards School and District Leaders, you'll learn about some of the most popular web tools used in schools but through a leadership lens. Understand how to be a more effective communicator and collaborator and boost productivity, at the same time understanding the need for school and district leaders be models of effective technology use. The Relevant Educator: How Connectedness Empowers Learning. 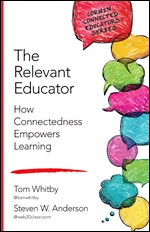 Written with my good friend Tom Whitby, the book not only lays out the simple tools educators can use to get connected but why it's important to use these tools for professional learning, engaging classrooms and more! 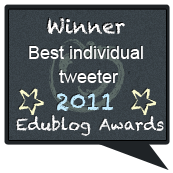 Filled with our own stories it's an easy read for any educator! Can Passion Cross The Line?